Will this fit the Coralife or Oceanic BioCube 14 Aquarium ? Is the Water Director included? Yes. It is needed for proper operation and we would never think of charging extra for something so necessary. Do you sell spare or replacement Water Directors? Do I need to cut the tab that goes half way across the baffle wall ? It is not necessary to cut this tab to install the water director like on previous versions (8 & 14). inTank still recommends removing this tab as it will distribute water more evenly across the water director. Using a razor blade along with a pliers or a dremel tool make quick work of it. A clean straight cut is not needed. How do you install the water direction piece ? 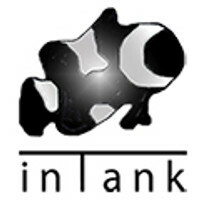 The inTank logo installs on the left, adjacent to the pump chamber. Angle the piece towards the rear of the aquarium then push straight down. The director features cut outs on the rear facing side to account for silicone in the aquarium. The piece rests on top of the chamber's molding.